Online application for admission to Graduate School – Click here to apply. Please Submit the following in one package to: Graduate Admission, Department of Chemistry & Biochemistry, PO BOX 17910, 1400 J R Lynch Street, Jackson State University, Jackson, MS 39217, USA; Phone: 601-979-2171. Two official copies of transcripts from all regionally accredited colleges and universities attended. Application fee ($25.00) for Out-of-state and International applicants (money order only: Payable to: Jackson State University). International applicants must submit satisfactory TOEFL (72) or IELTS (6.5) scores (Student without qualified English test scores can apply for English as a Second Language Institute: http://www.jsums.edu/global/testing-placement/​). Standardized test scores (GRE or Department Test: Contact Department of Chemistry for details). 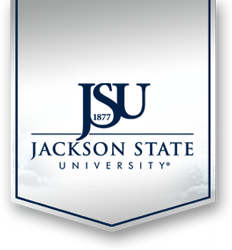 Jackson State University is designated as a "higher research activity" institution by the Carnegie Foundation. Website by AndiSites Inc., vitalink, and Zen Web, Inc.